For other uses, see Dastaan. Dastan (Persian: داستان‎ dâstân, meaning "story" or "tale") is an ornate form of oral history from Central Asia. A dastan is generally centered on one individual who protects his tribe or his people from an outside invader or enemy, although only occasionally can this figure be traced back to a historical person. This main character sets an example of how one should act, and the dastan becomes a teaching tool — for example the Sufi master and Turkic poet Ahmet Yesevi said "Let the scholars hear my wisdom, treating my words like a dastan". [This quote needs a citation] Alongside the wisdom, each dastan is rich with cultural history of interest to scholars. 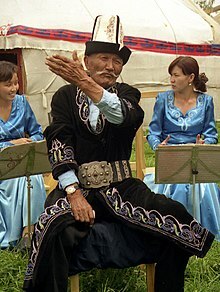 During the Russian invasion and occupation of Central Asia, many new dastans were created to protest the Russian occupation. It is possible that they came into contact and influenced each other. According to Turkish historian Hasan Bülent Paksoy, the Bolsheviks tried to destroy these symbols of culture, e.g. by only publishing them in insufficiently large quantities and in a distorted form "in order to weaken the heroic impact". A notable dastan is Korkut Ata of the Oghuz Turks — which may have been created as early as the beginning of the 13th century. ^ Russell, Ralph (1992). The Pursuit of Urdu Literature: A Select History. London and New Jersey: Zed Books. p. 85. ISBN 1-85649-029-7. ^ Paksoy, H.B. (1999). "Dastan Genre in Central Asia". Essays on Central Asia. Lawrence: Carrie. p. 82. OCLC 45603165. ^ Meeker, Michael E. (August 1992). "The Dede Korkut Ethic". International Journal of Middle East Studies. 24 (3): 395–417. doi:10.1017/S0020743800021954. The Book of Dede Korkut is an early record of oral Turkic folktales in Anatolia, and as such, one of the mythic charters of Turkish nationalist ideology. The oldest versions of the Book of Dede Korkut consist of two manuscripts copied in the 16th century. The twelve stories that are recorded in these manuscripts are believed to be derived from a cycle of stories and songs circulating among Turkic peoples living in northeastern Anatolia and northwestern Azerbaijan. According to Lewis (1974), an older substratum of these oral traditions dates to conflicts between the ancient Oghuz and their Turkish rivals in Central Asia (the Pecheneks and the Kipchaks), but this substratum has been clothed in references to the 14th-century campaigns of the Akkoyunlu Confederation of Turkic tribes against the Georgians, the Abkhaz, and the Greeks in Trebizond. Such stories and songs would have emerged no earlier than the beginning of the 13th century, and the written versions that have reached us would have been composed no later than the beginning of the 15th century. By this time, the Turkic peoples in question had been in touch with Islamic civilization for several centuries, had come to call themselves “Turcoman” rather than “Oghuz,” had close associations with sedentary and urbanized societies, and were participating in Islamized regimes that included nomads, farmers, and townsmen. Some had abandoned their nomadic way of life altogether. This page was last edited on 23 April 2019, at 16:06 (UTC).